But could you do it? 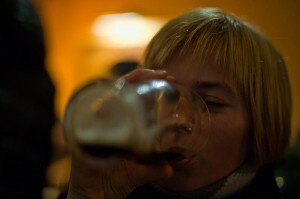 Could you survive 2012 without a taste of beer, wine or something stronger? Can a modern adult have fun without booze? What would your friends and family say? But why not ignore the advertising and go against tradition? I think that most people would admit that giving up alcohol would be good for the wallet, the kids, the stomach and the liver – even if a compromise on the “fun” front is required. We are so used to alcohol fuelling the whole Christmas holiday bonanza that it’s hard to imagine going without. But look at the children – they seem to have a good time without the need to be always holding a glass. And think of all the food that will soon be making its way into your gut; why not give your stomach a break and spare it having to process all those extra calories you will be pouring down your throat (in case you didn’t know: the body treats alcohol like a sugar). “When did drinking become obligatory?” writes Zoe Strimpel in Psychology Today, “every social occasion seems to revolve around alcohol.” Most of us become dependent on alcohol without becoming alcoholics. For years and years I would have a bottle of red wine with dinner, two if someone else came round, and I could never leave a bottle empty. Alcohol has a calming effect on the brain and some people can’t sleep or relax without it. Some City traders in London are fired up in the day by the adrenaline and excitement of their work, supplemented by lines of cocaine taken during toilet breaks, and by night they need alcohol to unwind, relax and sleep. People can function like this for years. I found that giving up alcohol was a lot easier than I expected. I drunk my last bottle of wine on the 31st of December 2006 and since then all I have had was a glass of Campari and orange (which I thought was orange juice but then enjoyed the taste so much that I had to finish it) and a quarter glass of Mateus Rose when everyone else round the table was toasting an American friend of mine who had just announced her transition from man to woman. I gave up because my wine drinking was becoming so habitual that I wondered if I could get through dinner without a bottle. I was also feeling bloated a lot of the time and I experimented by giving up pasta and bread (no effect) and then alcohol – which did the trick. I was also thinking about all the money I was giving to a government that I didn’t like and hadn’t elected. I never intended to stay abstinent for so long but I feel no urge to go back to the bottle. The alternatives cost less, taste better and tend to be good for you. Nothing beats freshly squeezed lemon juice mixed up (before adding water) with honey. Chilled mineral water can hit the spot like nothing else when you’re thirsty. I used to drink Coca-Cola as a hangover cure but now I take it when I need an energy boost (and am in a mood to ignore the fact that 30% of it consists of sugar). I’m looking forward to my fifth alcohol-free year. I am immune to the scorn of my fellow revellers, will use blackberry syrup to join in the toast to 2012 and I intend to join the kids in the silly games department rather than standing around pouring poison into my innards. Rupert Wolfe Murray is the PR Advisor to Castle Craig rehab clinic. 3 Responses to Why Not Give Up Alcohol? I’m not the right guy to answer. I almost consume no alcohol, because I drive, I must be sober at work and after maybe 2 beers or 2 glasses of wine, I have headaches. So I go mostly for non-alcoholic drinks. I quit smoking 5 weeks ago, etc. So, the issue of alcoholism, as I have seen in news about UK, is a big problem there. And really it is beyong comprehesion why would I want to be remebered by society lying like a pig on a sidewalk….It is probably related with, there, lack of a positive self-esteem ? I think the problem of excessive alcohol drinking is present in much more countries than one would imagine… not just UK or Russia as the folklore promotes it…but I think all around… In the Romanian countryside for instance there is so much daily drinking it is unbelievable!!! The most I hate about it is that it is so embedded in what is though to be tradition and customary that hosts (to holidays events or simple meetings when you have someone over for dinner) offer it insistently and get upset if you refuse while at the same time guests do not refuse it for fear of not being seen as a fussy or strange person…. as if it’s written in the good manners guide everyone must drink! And the second thing I hate the most is the association between having fund and drinking – there are sooo many people, mostly young but not only, who cannot conceive an evening with friends or a night out without alcohol being involved. And those who don’t drink are not cool or strange, to say the least. Why?? I like what you said about alcohol being a social lubricant – but I feel very sad we ended up in this phase where we need such a lubricant at all to be able to interact and enjoy each other’s company!